46elks is now public on Zapier the beta period is history. 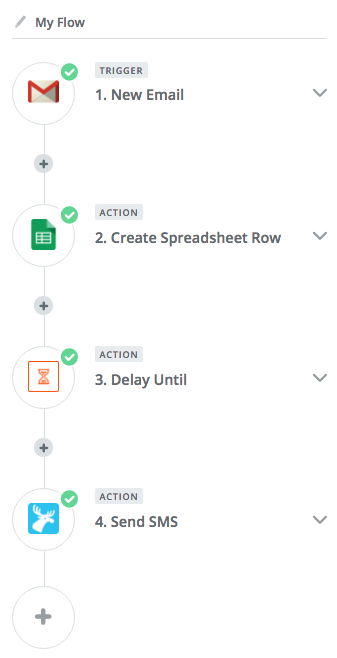 Zapier has also added some nice features like Delays and multiple actions on one trigger. I wanted to have a holiday some weeks ago, and i did not want to check my email during that time. However I still wanted to get an update every Friday by SMS regarding the subjects of the emails sent to me exclusively. I connected the Zapier to my Gmail and connected it to a spreadsheet to have an overview of the messages that were relevant, there I made a filter to avoid getting emails where I was CCâ€™ed or one for several recipients. The next step was to add the great function of Delay, (a new Zapier native function). That allows you to select in my case "next friday at 15:00". Iâ€™ve learned that it is important to remember to charge the 46elks account with credit before going for a vacation.